Subtitles are a very important aspect of videos. It can make the viewer engage with the concepts and ideas shared in the video than just plainly viewing it. If you are a YouTube video creator or a video marketer, you need to make your videos likable and shareable across the social media and channels to stay ahead of the competition. 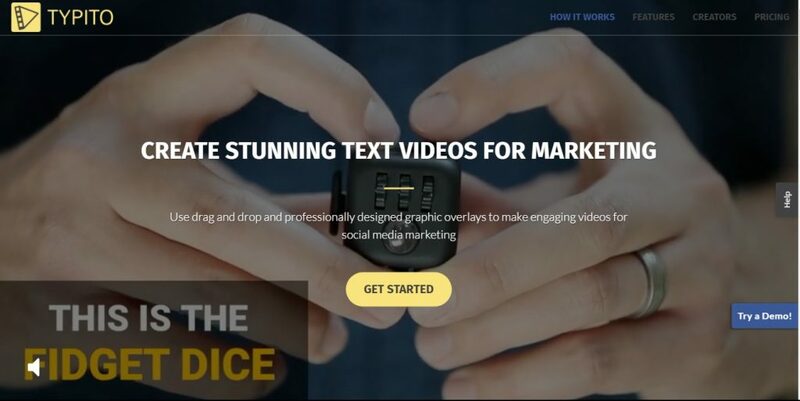 Videos with attractive open and closed captions, highlighted texts, and subtitles grab people’s attention. It will also make your video likable on YouTube a well as shareable on Facebook, IGTV and other major platforms. 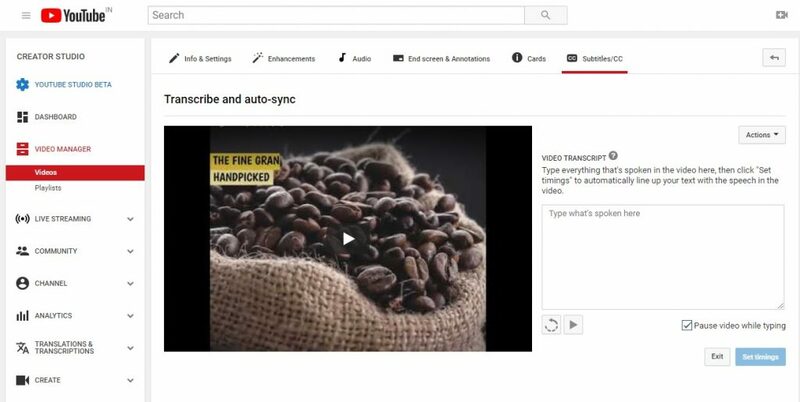 In this blog, we present you a complete guide to add engaging subtitles to your YouTube video. Subtitles make videos enjoyable to people who are not familiar with the language used in the video or are learning it. You can target any country you would like to grow your audience. Helps you to diversify your content to a wider audience. Lets you add subtitles for signs, letters as well as actions along with the dialogue to aid people who are learning a new language or people who are completely or partially blind or have a hearing impairment to enjoy the video. Help to reduce the cost of voice dubbing the entire video content you produced for other countries or for people who are not familiar with the language of the video you produced. One big bonus about this approach is that you can also keep the original audio track of your video. You can add subtitles for YouTube videos in two ways. You can directly go the YouTube Video Manager, select your video and add subtitles manually. 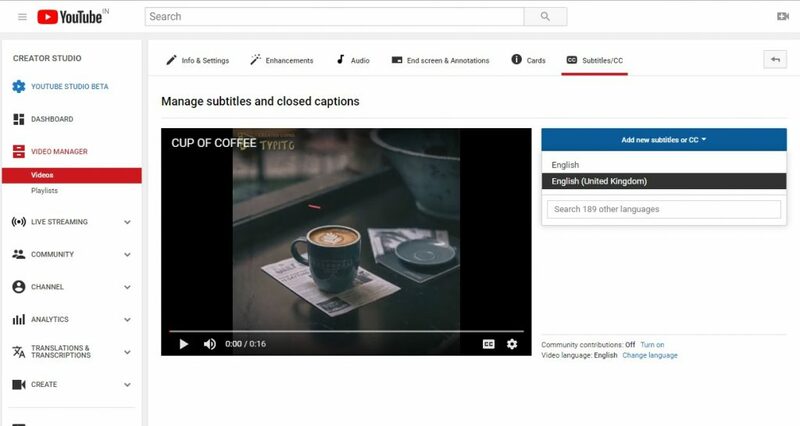 The other way is to use Typito to easily add subtitles and upload directly to YouTube. In this option, you can go with a text transcript or a subtitle file you already have. You can directly upload from your computer via using the “ choose file” option and then hit the “upload” button. In this option, you can type in everything that’s spoken in the video in the box. 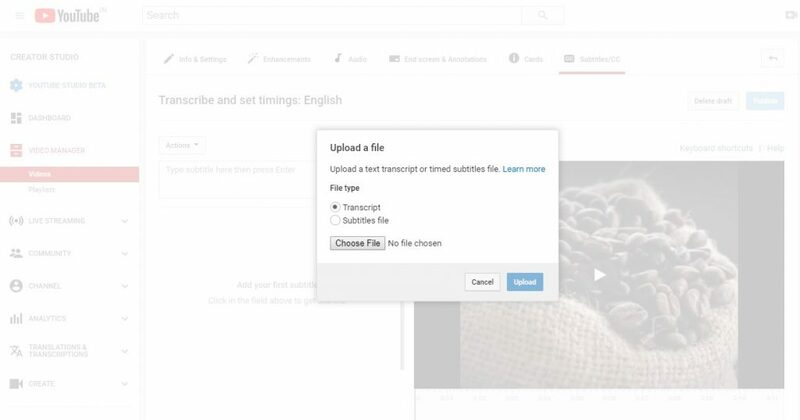 You need to click “Set timings” to automatically synchronize your subtitle text with the speech in the video. To create subtitles manually, you need to follow the steps explained below. Find the video which you want to add subtitles. Click the drop-down menu next to the Edit button. From the drop-down menu, click Select language. Now select the language which you have used in your video. Then, click Add subtitles or CC. In YouTube, you need to select the primary language before adding subtitles or captions. Select Method: Choose how to add subtitle via three options; Upload a File, Transcribe and auto-sync, and Create new subtitles or CC. Play the video and note where the words and sounds in the video come out. Pause the video and type the subtitles in appropriate places into “Type subtitle here and press Enter” box. Repeat this process for all the spoken words in the video. Click Submit when you have finished. Now you know how to add manual subtitles. Let’s now see how to add permanent subtitles in Videos. The screen size of your video. You need to adjust the word spacing as well as the subtitle position to avoid people missing the important actions taking place on the screen. The subtitles should consume only as much space to accommodate the words. It should give enough room for excellent video viewing experience. Now, let’s take a look at how to add permanent subtitles to Videos. You can use Typito Video Editor to add permanent subtitles. You can add highlighted texts, captions as well as subtitles in Typito Editor to create engaging videos. If you don’t have a Typito account, you can sign up for free from here. After you have successfully logged in, its time to add some subtitles to make it more engaging. First, You need to upload your new video to the editor. You can easily upload via the “Upload Media” option. After you have uploaded your video, you need to go to the “TEXT” tab. From this tab, you need to select “ Add a Subtitle” option. After you have clicked on the “Add a Subtitle” option, a box will appear on the right side of the video editing screen. The box has many options like transparency, fond selection, text color selection and more. You can choose the ideal font that matches the video, and input text that will run in synchronization with the characters and their dialogues. 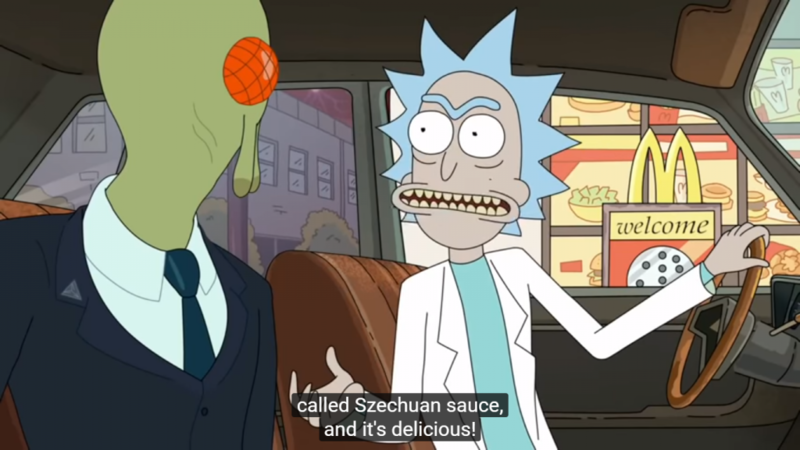 Use the timeline editor to carefully place the subtitles. At the bottom of the editor, you can see the timeline frame stretcher. You can stretch or contract the timeline of your video using the “Plus” and “minus” icon to your desired position. This feature lets you place the text synchronized with the dialogue delivery. After you have placed the text, you can adjust the background color of the text or make it transparent or opaque according to your needs. The “Opacity” tool will help you to make it easier for the viewer to read the subtitles. 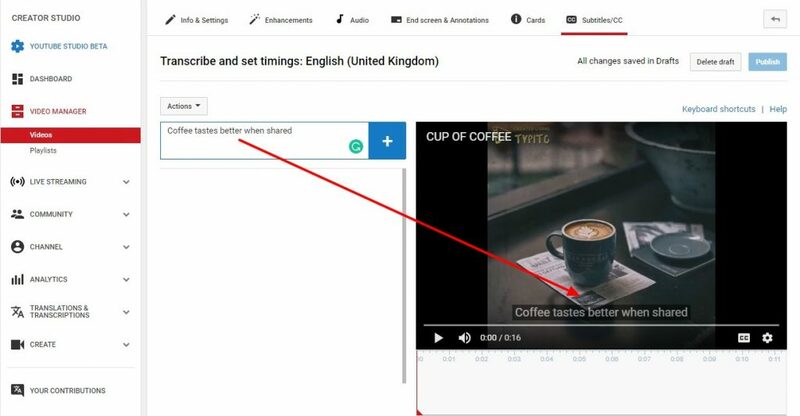 You can follow the same procedure to add subtitle for youtube videos wherever your video demands. After carefully placing subtitles, you can then play the video from start to end to check whether all the subtitle blocks are right in place. To adjust the position of the subtitles, you can easily select the block you want to move and adjust its position with the help of the timeline editor. Along with subtitles, attractive captions can make your short social media video posts engaging. You can go through our wide range of caption templates collection and add it to your short videos. Now, after you have edited the whole video with permanent subtitles, its time to export the video to your computer for uploading on YouTube. 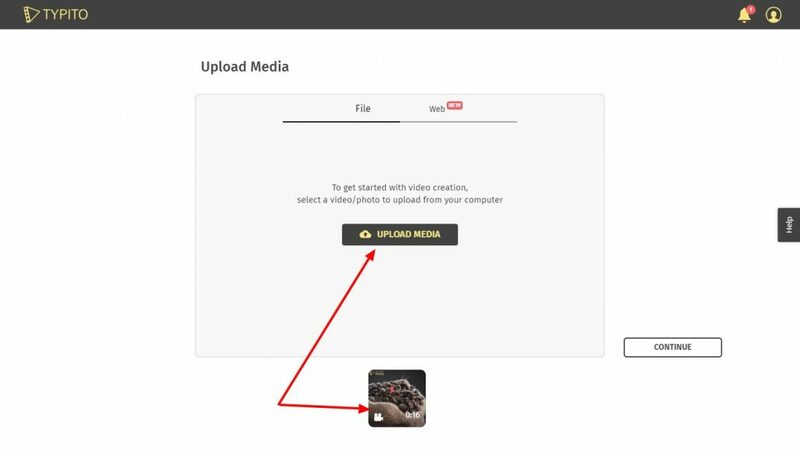 You can also directly upload your video to YouTube from the Typito video editor itself. If you are new to Typito, then you can through the website and make yourself at home by creating a lifetime free Typito account from here. To have you get started with Typito, we will send you articles per week that include, Typito tip and tricks, video production tricks and other contents to make you a superb video creator. Get Started. nice information. For you who want to engage subtitle to video, you can try wonderfox hd video converter factory. It not only can help you download youtube videos but also add subtitles to video.